Durable and Light Material: Made of durable and lightweight aircraft grade 7075 Aluminum Alloy, which can strongly reduce damage from repetitive impact force! Each collapsible trekking poles’s weight is only 8.5 oz, so light for outdoor portablity. 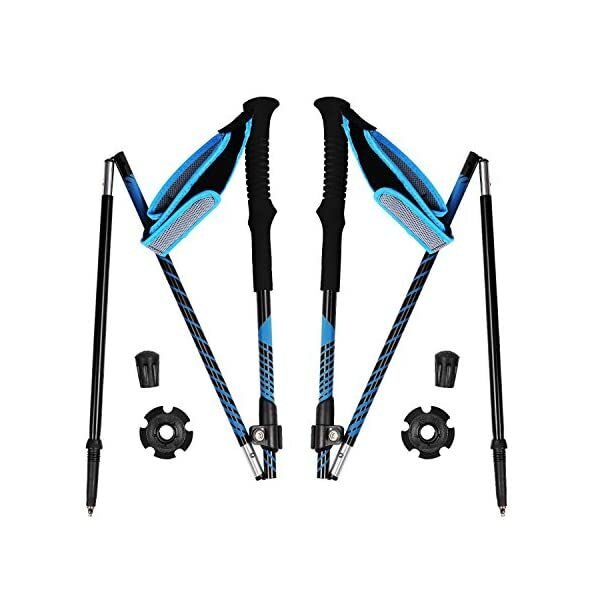 Easy Lock and Collapsible: With Quick Flip Lock, can be collapsible to adjust the foldable hiking poles length from 13.8 to 49.2 inches, which is suitable for each hiker from 5 to 7 feet tall. Multi-terrain: Tackle any terrain with the tungsten-tipped ends, removable rubber ferrules, and mud/snow baskets. Explore nature’s beauty with increased balance, stability, and endurance! 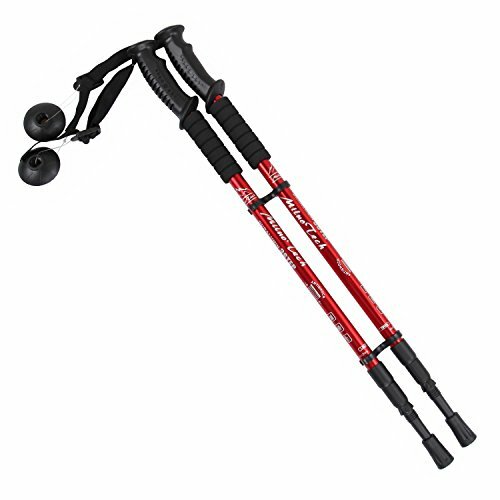 Use this REDCAMP trekking poles collapsible for hiking on various rough terrain to keep your knees from being exposed to pain and discomfort. 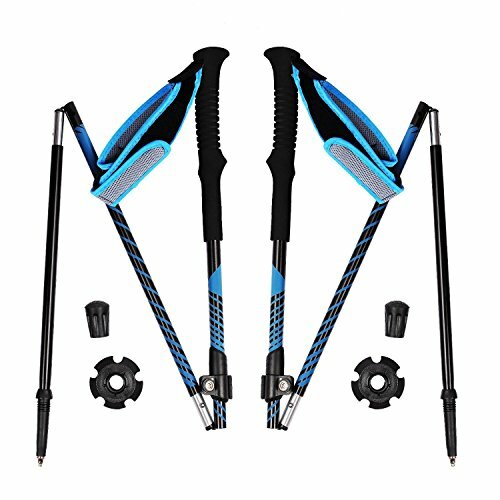 Please check out below and you’re going to find this foldable hiking stick by REDCAMP is the perfect match that you have been in search of. 1. High Quality walking sticks collapsible made of ultralight and durable aerospace-grade 7075 aluminum alloy. The collapsible 4 sections with diameter 16/14/14/14mm. It is easy for storage. 2. Weather and temperature resistant. 3. Comfortable EVA foam grip handles. Adjustable wrist straps, provides enhanced balance and stability whilst hiking on unforgiving surfaces. 4. The tungsten steel-tipped ends reduces strain and stress on your ankle and knee joints. Aids with uphill treks. Interchangeable tips can help you switch between tungsten-carbide tips, rubber tips, and rubber feet to account for changing trail surfaces. Make your walking stick for hiking go smoothly in any terrain. 1. Each pole weighs 8.5ounces (1.1 lbs per pair). 2. Extends from 13.8 – 49.2inches/35 – 125cm. Durable and Light Material: Made of durable and lightweight aircraft grade 7075 Aluminum Alloy, which can strongly reduce damage from repetitive have an effect on force! Each collapsible trekking poles’s weight is only 8.5 oz, so light for outdoor portablity. Easy Lock and Collapsible: With Quick Flip Lock, will also be collapsible to adjust the foldable hiking poles length from 13.8 to 49.2 inches, which is suitable for each hiker from 5 to 7 feet tall. Enjoy Your Outdoor Life: Our Aluminium trekking poles are perfect for hiking, backpacking, walking, mountaineering, snowshoeing, climbing, and all adventure trip! 100% Money Back Guarantee: If you aren’t completely satisfied with this walking stick for hiking, please contact us and we offer a 30 day 100% money back guarantee. REDCAMP is dedicated to address any product/service issues and is committed to delivering a 5 star experience for all buyers.